2. Open up your chatroom tab at the bottom right of the screen. 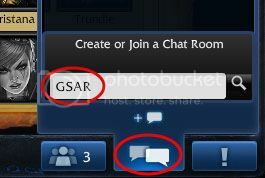 Click the "Create or join a chatroom" button (the text bubble icon with a "+" next to it) and enter "GSAR". Hit enter. 3. 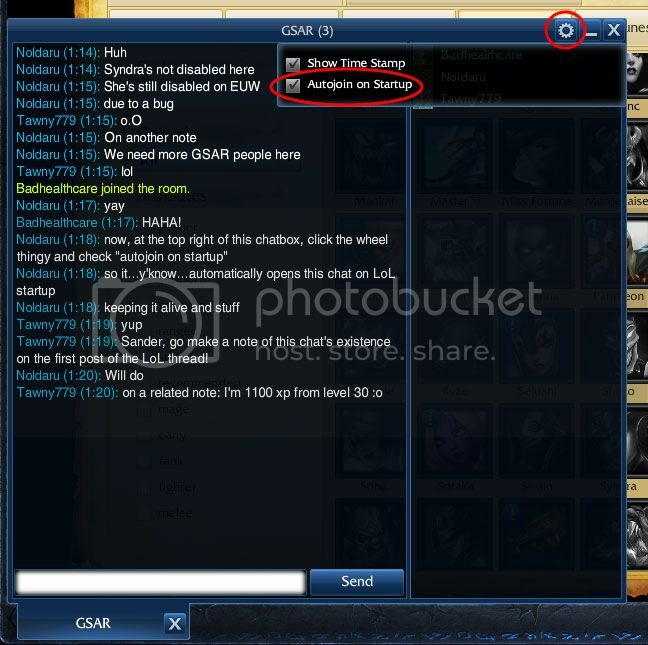 Open up the newly opened chat wind&#111;w. At the top right, click the options button (the little wheel) and tick the "Autojoin on startup" checkbox. Also, my PBE name is Princess Snow. Hmmm. I've been meaning to look into LoL, but I never found the time. I have some questions about the game, and you all should be able to answer them. 1. Is the game free to play? I'm sure i'll come up with more questions later, but that's the top ones I have right now. Yes it's free to play, theres the option to buy points in order to get items 'quicker' but if you're patient and earn your money through matches then you dont have to worry about buying any points with real money. And it usually depends on what type of player you are and which character/champion you can handle pretty well. Since theres multiple champions and characters, theres a lot of skills and ways to use them.. however there's always helpful tips online and on the site that'll help you work out your characters. I suggest finding a champion you can work well with (I usually test out champions in Player vs Bot, because the enemy are NPCS and won't be jerks to a newbie) and then earn points or ingame currency by winning matches and getting enough to buy the champion card permanently. 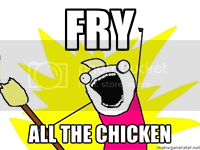 That's what I did when i got Cho'Gath. He was in one of the free summons (this changes, it's not permanent) and it was easy and fun for me to use (although i didn't know he could feed until someone in my team told me). So i got him permanently as my 1st champ. If you're into strategy games, you'll probably get the hang of it quicker. In my friend's case, she was very confused when she played it; she wasn't use to strategy games. Depends on your experience on these things. I tried Amumu and failed horribly, but in another match someone was a massive pro using him. Again, whichever champion suits you best/works with you. EDIT: Whenever im deciding which champion to buy next; I search up tutorial videos on them and see whether I like them or not, if it'll be easy for me to use, etc. Plenty of vids up on youtube and L.O.L has their own youtube account. tl;dr on Soriya's learning curve thing: to be super awesome at the game, yeah you'll have to invest a lot of hours. But the only person on here who could really be considered super awesome would be LS I think. To be decent at the game, it'll take some hours to learn the different role's, but that's something we (the more experienced players of the Refuge, though I use this phrase loosely.) can always help you with. We can enroll you in the Swordmaster School of LoL...basically play a couple custom games a week to teach you the basics of playing in the PvP environment. It seems to be helping Zack out, since we've started teaching him I've noticed he plays better. He still has a lot to learn...but he is learning. Influence Points (IP): Gained through matches, basically just playing the game. This can be used to buy champions, runes (which enhance your champion's stats in-game) and rune pages (to which you can assign runes and which you can in turn assign to your champion when starting a match). Riot Points (RP): Bought with real money. These are the "premium" points, if you will. Can be used to buy champions, champion skins, EXP / IP boosts, rune pages, bundles comprising of a combination of the aforementioned, and some minor stuff like server transfers and name changes. You cannot buy runes with these points. Riot makes it a point (harrharr) to not give players that buy RP an unfair stat / skill advantage in game, so other than not getting any skins there's not that much of a downside to not spending any money on the game. On another note, I'm still quite rusty when playing, because I don't play nearly as much as I used to. But I like to consider myself an experienced player. Not the best, but certainly not beginner-level either. But I like to consider myself an experienced player. Not the best, but certainly not beginner-level either. 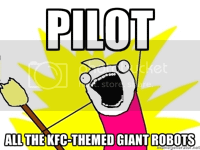 That's about how I'd consider myself as well. @Tawny sorry that its too long :x i just talked about different ways that helped me out when i started basically. I understand that, and it's good that you did! I just wanted to summarize the basics of that part of his question for Umbra's convenience. I'm not saying he shouldn't read your suggestions, I really think he should, they're great suggestions! Hmm... 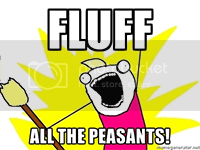 I think id consider myself a noob at many times xD like if im gone for a long while.. So your not the only one Umbra; if you decide to play ;v;.. I'll need to review some stuff since the major updates, but the concepts are the same. I'll introduce concepts and Dara can comment/correct and add with particulars. @SM Yeah ikr.. Need to learn more about the shop and.. I think they have a new ping system now right? Well my spring beak is coming in a week or two, so that's when I'll probably get into this. Until then, I'm probably gonna keep working out a perfect FE:A party. I'll get back to you on that, SM. Thanks for answering my questions, guys. Ai, there's a new ping system, Riya. And, yeah, I'm busy with a paper until next week. After that, I'd be happy to show you the ropes. I usually just pinged anyways; so, this works. Mmm, yeah! I'd definitely love to help out any way I can! I feel like there is a bit of a steep learning curve to the game, but only because there is a lot of information to take in and it can be really overwhelming at first. Playing the tutorials is helpful to get the basic mechanics of the game down. Playing Co-op vs. AI is a good way to pick up on the game on your own time without worrying about getting harassed or stomped by players with alternate accounts. They have beginner and intermediate levels, too. I would suggest playing those until at least level 5. (I played bot games until level 12 personally, so I don't see the shame in it.) But, you DO want to switch to PvP at some point so that you get used to playing against other people, too. I could say a lot more, but I think that I'll keep it there for now. In my own experience, I found 3v3 really great for picking up on some basics. While you don't use then in the traditional 5v5, it gives you a general idea in terms of roles, items and how to play.